The awareness of individuals in a particular social class that they share common interests and a common social situation. 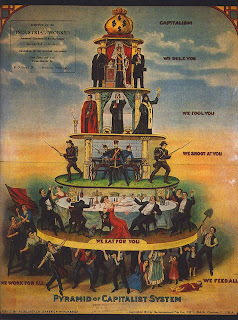 Class consciousness is associated with the development of a ‘class-for-itself’ where individuals within the class unite to pursue their shared interests. The joke used to be that class consciousness was never strong in Ireland because everyone was convinced they were descended from High Kings and chieftains anyway! A more modern take on it might be that the world has become smaller and more intimate. The Irish have embraced social networking tools like Bebo and Facebook with passion, such that there are no longer seven degrees of separation between people but three degrees of separation. If the 'common interests' and 'common social situation' you share with others are mediated by the web and mobiles then is it class consciousness? But on its own social class usually has limited, separate explanatory power when we allow for the influence of other key variables on attitudes, behaviours and circumstances including: age, gender, educational attainment and marital status. This is not to say that income levels don't have a powerful effect - indeed they do. But as in the case of the student living at home, personal income is a very blunt guide to economic status and wellbeing. A fact deliberately ignored by many in the poverty lobby when they lament the scale of 'working poverty' - in fact a lot of the people on low incomes are young people (often 2nd/3rd level students) working part time to have some spare cash for themselves. Fifty percent of the variance in inequality in lifetime earnings is determined by age 18 (Cunha and Heckman, 2007). The family plays a powerful role in shaping adult outcomes that is not fully recognised by current American policies. As programs are currently configured, interventions early in the lives of disadvantaged children have substantially higher economic returns than later interventions such as reduced pupil-teacher ratios, public job training programs, convict rehabilitation programs, adult literacy programs, tuition subsidies, or expenditure on police. This is because life-cycle skill formation is dynamic in nature. Skill begets skill; motivation begets motivation. Motivation cross-fosters skill, and skill cross-fosters motivation. If a child is not motivated to learn and engage early on in life, the more likely it is that when the child becomes an adult, he or she will fail in social and economic life. The longer society waits to intervene in the life cycle of a disadvantaged child, the more costly it is to remediate disadvantage. That is the great virtue of the Middle Class: its transmission of non-cognitive skills to the next generation at no cost to the state. No wonder the future belongs to the Middle Class. Though they may not be conscious of it of course.